Am I the only one who is shocked that today is the last day of September? It's as if I blinked, and another month passed. Before you know it, winter will be here and I haven't even been apple picking yet! The good news is the weather has cooled off, which means I got to start wearing my favorite sweaters (except for yesterday, temps were in the 80's). There is nothing I love more than cuddling up in a cozy sweater on a crisp fall day, and this sweater from Voom by Joy Han is a new love of mine. Although it's classic in the front, I love that there is a little party happening in the back, with the cut out details. It's the perfect sweater to run around in during the day, then add a pair of heels and a statement necklace and you're set to grab drinks with the girls. 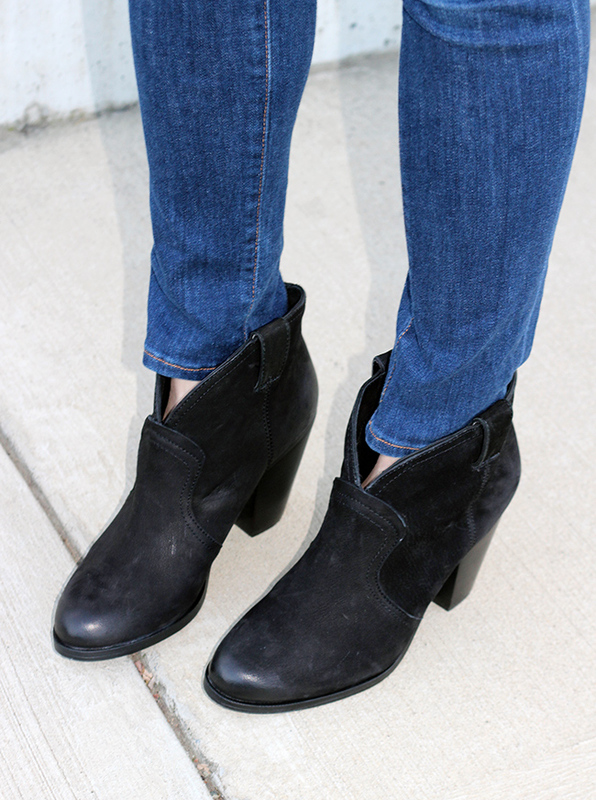 In addition to wearing these boots non stop (they are so comfortable, I highly suggest them! ), you may have noticed that I have been wearing a lot of Voom and Vava by Joy Han, as the brand had recently become one of my favorites. Not only are the price point reasonable, but I love the slight boho vibe of the brand. I feel these pieces have made my mostly classic wardrobe a little more fun. I hope everyone has a great second half of the week! Thank you for reading. That is the perfect heather grey sweater with the nice little surprise on the back. I need a simple, classic gray sweater too. Love your sunglasses and purse. And I agree, where did September go? What a chic outfit! I love the back of that sweater and those boots! What a cool sweater. You always find the neatest pieces. I love how those booties dip in the front. It's so flattering to the leg line. The details on the back make this sweater so special! I really like the jeans! They fit you perfectly! Have a great day! that sweater is beautiful! so unique! I adore the sweater you're wearing! Love the back of that sweater! What a lovely surprise. Love the back detail of your sweater! You look so chic! I can't even remember what I all did in September, how can it be over? I love that gray top, such a fun back to it and those booties are excellent, too! Thank you so much for your support for our surgeries. We are both doing very well and I will get back to work tomorrow! :) I really appreciate your nice comments! Don’t forget to come back every Wednesday to link up with me! This sweater is so perfect!! I love your uncomplicated, effortless and chic look!